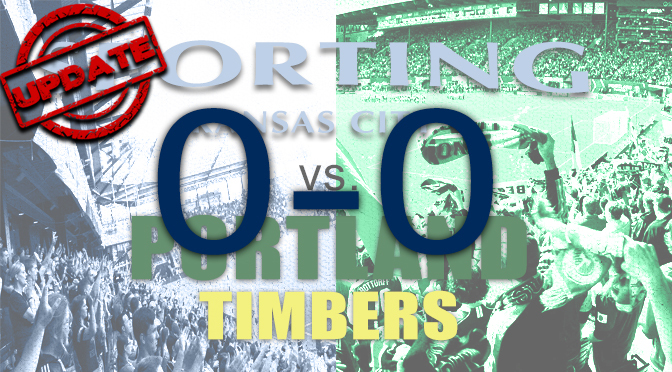 Sporting Kansas City and the Portland Timbers played a grind-it-out match which ended in a 0-0 draw, thanks in large part to goalkeeper Tim Melia’s seven-save performance. The draw bring Sporting into a 4-team tie for fourth place in the Western Conference with he season coming to a close rapidly. Sporting holds two games in-hand against both Seattle and Portland, which gives them an advantage, so long as they continue to avoid losses. Both teams were missing multiple players because of international duty and suspensions (two for Portland), but those that were able to take the field fought hard on both sides. In the 64th minute, Graham Zusi had a chance to score for Sporting, but was deflected away and led to a breakout for Portland, giving the Timbers a chance at a score before Melia came up huge again for Sporting. As the season winds down, it’s becoming more and more of a nail-biting finish for Sporting. With players missing action at various times this season due to International duty, Sporting has had to patch-work its lineup to make up for the loss of its best players. Most teams in the MLS face a similar issue, making the season true grind in that respect. Peter Vermes has a team capable of winning another MLS title, but defensively, needs to shore up its play. Wednesday’s 0-0 draw with Portland was a great start to that, as well as Melia’s seven saves which was a career-high. Sporting is finishing up a 4-game road trip by leaving Portland and heading to Orlando for a national televised match against Orlando City SC. The match is scheduled to air on FOX Sports 1, and FOX Sports Deportes, at 6:00 p.m., CST. Sunday’s match will mark the inaugural meeting between the two clubs and will give Sporting the chance to capture three important points in the standings with a victory. Sporting fans, your team heads back to Sporting Park on Friday, September 18 to take on FC Dallas. Tickets For Less has plenty of incredible seating and pricing options for you and friends or family to attend the match and cheer on your home-town team. Head over to Tickets For Less to purchase your tickets today. You don’t want to miss out on any of the action happening at the best home-field advantage in the MLS, Sporting Park.